The workshop enabled an exchange of ideas on migrant narratives with a focus on methodical and analytical questions. Prof. Dr. Brigitte Bönisch-Brednich opened the workshop as keynote speaker, talking about the role of the scientist, the narrator migrant and a toolbox approach for the analysis of oral sources. Within the following two days, the participants had the opportunity of giving short presentations to stimulate discussions moderated by Prof. Dr. Anton Escher (JGU Mainz). Prof. Dr. Silke Meyer and Fatma Haron, MA. 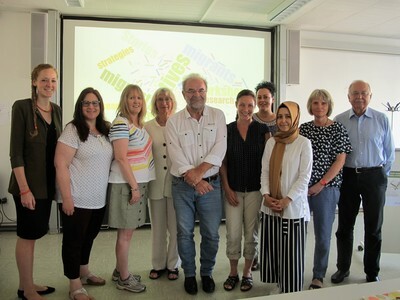 (Innsbruck University) provided insights into narrative analysis as a hermeneutic method using an interview extract from their research project on remittances. How metaphors can serve as analytical tools to structure the experiences and storytelling of e.g. English women living in Spain became clear thanks to the statement of Dr. Anya Ahmed (University of Salford Manchester). With the example of a mythical story of a Lebanese diasporic village community, Dipl.-Geogr. Marie Karner (JGU Mainz) illustrated the community-building function of narratives. These narratives contribute to the re-creation of a common identity by emphasizing the internal cohesion and shared values. Prof. Dr. Angela McCarthy (University of Otago) presented how one can conceive a historical study through the stories of and about a person. She used the example of James Taylor, who developed the tea industry in the former British Ceylon. Prof. Dr. Marita Eastmond (University of Gothenburg) examined the challenges, limits and limitations of narrative research with regard to the silence of interviewees over certain incidents. Prof. Dr. Anastasia Christou (Middlesex University London) started a debate on visual, affective, embodied, acoustic, symbolic and mediated narrations of migrants. She showed a short video clip, which expresses the traumatic experiences of diasporic groups and their feelings of belonging to a homeland. Dr. J. Olaf Kleist (Osnabrück University) shared results of his current research project on Syrian refugees’ recollections of flight in Germany. Since their memories and narrations seem to be affected by their assumed criteria for gaining the right to asylum, the issues of strategic communication and strategic narrations of migrants were raised. Prof. Dr. Rolf Wilhelm Brednich (Victoria University of Wellington) summed up the workshop with a comment on the motives of migration histories in historical narrative research, which included references to fairy tales and legends.